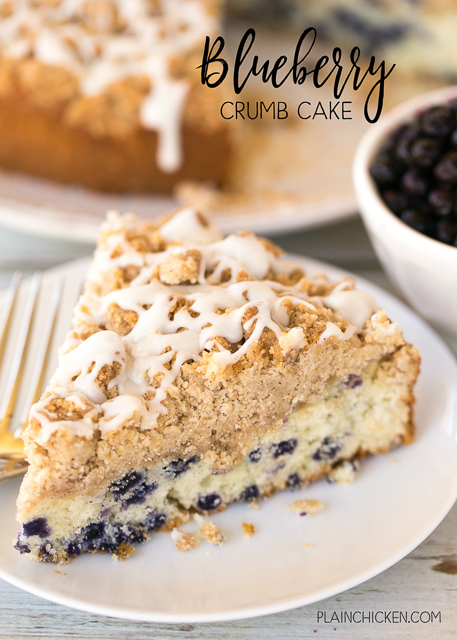 Blueberry Crumb Cake - easy and delicious breakfast treat! Blueberry muffin mix topped with an easy crumb topping. Seriously DELICIOUS! Martha White blueberry muffin mix, milk, sugar, brown sugar, cinnamon, flour, butter, powdered sugar, vanilla. Can make ahead and reheat in the morning. Great for breakfast or dessert!! YUM! 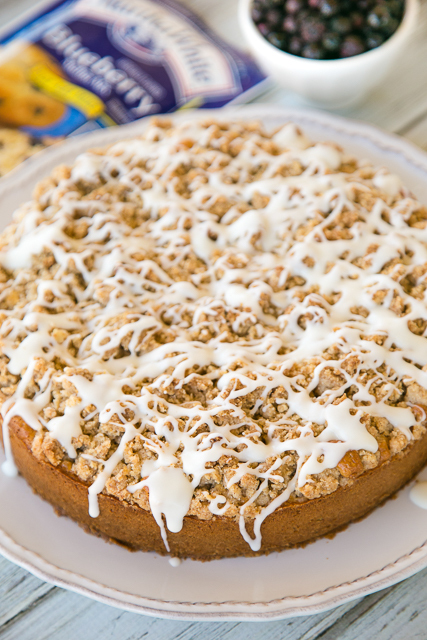 This Blueberry Crumb Cake is one of our favorite breakfast treats! It is so easy to make and it tastes great!! We ate this for breakfast and dessert. It is best if you reheat your slice in the microwave for a few seconds. You could even put a big ol' scoop of ice cream on top too. I won't judge! The base of the cake is made with Martha White Blueberry Muffin Mix. I love using the Martha White mixes in cakes and casseroles! They are SO easy to use! I made the muffin mix and poured it into a springform pan. I topped the batter with a quick crumb mixture and baked the cake for about 30 minutes. OMG! SO good! You can make this the night before and slightly reheat it for breakfast the next morning. This will keep for a few days covered tightly. Our friends at Martha White are giving away a chance to go to the Martha White® 2017 Nothing But Country CMA Music Festival in Nashville! You have a chance to win one of 4 trips for two to Nashville to attend the festival! These tickets are tough to get, so make sure to use the link below to enter!! 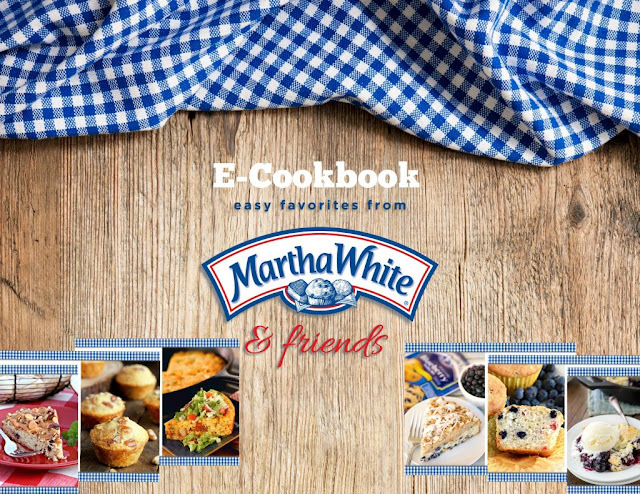 To celebrate the Martha White® 2017 Nothing But Country CMA Music Festival, Martha White compiled a FREE E-book with some of their favorite recipes! All of these recipes are easy and delicious. There are both sweet and savory recipes. You don't want to miss this!! Click below to download the book. Preheat oven to 425ºF. Lightly spray a 9-inch springform pan with cooking spray. Set aside. Mix together muffin mix and 1-1/4 cups milk. Pour into prepared pan. Mix together sugar, brown sugar, cinnamon, flour and melted butter until crumbly. Sprinkle over top of muffin mix. Bake for 30 to 35 minutes, until a toothpick inserted comes out clean. Allow cake to cool and remove from pan. Whisk together powdered sugar, vanilla and milk. Drizzle over cake and slice. I love Martha White muffins, and this cake looks amazing! Can't wait to try it out. Did you also put fresh blueberries in this? Recipe doesn't say so, but in your 2nd picture there appears to be a bowl of blueberries. I didn't add extra blueberries.